I’ve spent quite a bit of time looking at the new array of Windows 8 tablets lately. It seems like there’s a new one popping up every week. That’s probably an exaggeration, but it sure feels that way. And I can say without hesitation, that if you’re looking for a Windows 8 tablet there’s something out there for you regardless of your taste or preference. Based on my own needs and desires the Surface Pro has been the object of my desire lately. It’s about the right size, has plenty of horsepower, has a unique keyboard configuration, and offers pen support. I would have already had one, but the first three times I went into a Microsoft Retail Store to purchase one they were sold out. And now that we’re several months down the road I’ve chosen to hold off for various reasons. One of the big negatives for me with the Surface Pro was the battery life. I know a couple of people that own a Surface Pro and they’ve reported real world numbers at around 3.5 to 4 hours of continuous use. Not horrible, but not good either. My old Lenovo x201t gets about 4 to 5 hours on a charge in comparision. 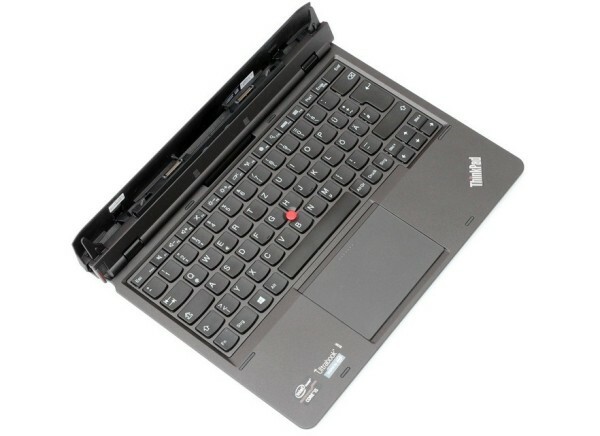 Enter the ThinkPad Helix. The tablet has been around for several months, but for whatever reason it seems to have flown under my tablet radar. After closer inspection I find that I’m drawn to this machine for a host of reasons. Here’s the kicker though, the Helix has a keyboard dock that’s an engineering marvel. More so than any of the other keyboard dock that I’ve seen, the Helix dock turns the 11.6-inch slate into a bonafide notebook. Besides giving the user an awesome ThinkPad keyboard, over-sized trackpad and ever present Trackpoint, the dock offers additional ports and another 4-cell 28 WHr battery. Lenovo claims 10 hours of battery life from the slate and dock combo. Of course mileage may vary, but reviews that I’ve read have indicated near 8 hour run time. That’s amazing for a Core i7 machine. One of the most impressive things about the keyboard dock is the docking mechanism that locks the slate tightly in place, but offers an easy release mechanism. It’s also designed in such as way as to allow the user to place the slate in the dock forward facing or rear facing; the latter in case you want to fold the slate over on top of the keyboard and use it as a convertible tablet without removing the slate from the dock. It really is quite ingenious. The slate plus keyboard dock weigh in at around 3.8 pounds. I initially wrinkled my nose at such as weight. After all things today are going smaller. Ultrabooks are all the rage. But then I decided to compare that weight to something I could relate to, i.e. my daughter’s 13-inch MacBook Pro. According to the Apple site the 13-inch MacBook Pro comes in at around 4.5 pounds, while the 13.3-inch MacBook Air tips the scales at just under 3 pounds. So overall the Helix isn’t bad. The Helix slate alone is only 1.8 pounds, which makes it respectable, especially when you consider what you get inside the tablet for that 1.8 pounds. The only downside to the Helix is the price. I configured one for myself with an Intel Core i7 processor, 8 GB of memory and a 256 GB SSD Drive. The price came in at around $2300. Ouch. Even with some promotional codes I found lying around the price was still $1800. Needless to say it’s still sitting in the Lenovo online shopping cart where it will remain until someone removes it. The Helix is the tablet I’d own today if money was no object. This thing really is in a class all by itself. There are plenty of reviews of the Helix on the internet. I’ve read through several as well as watched several on YouTube. I felt that the one below was well done and did a solid job of pointing out a lot of the little details that make a ThinkPad a ThinkPad. Sounds like you’ve found your next machine. Let me know when you get it. I’d like to see it in action. I certainly have. If money was no object that is. For now I’ll plug along with my trusty X201 Tablet. It’s a solid machine and it gets the job done.